The Gruen "Tank" models, produced from 1929 to 1935, are particularly hard to find. It seems that it's easier to procure an 877 Techniquadron than a Tank! 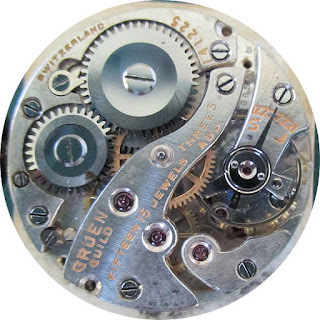 I've only come across two or three in the 30 years I've been collecting, and all of those have been the "small" Tank, measuring a mere 32mm long by 24mm wide, and easily mistaken for a lady's watch. I had Kirk-Rich do the luminous paint on the dial and hands in an antique tan color, so the dial looks aged, though artificially of course. 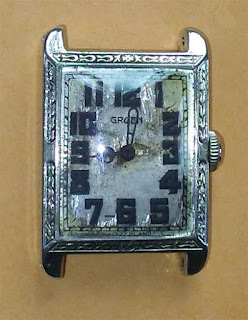 This is my personal preference; there's something just too "shocking" to me about an 87-year old watch with green luminous that makes the watch look looks like it came right out of a gumball machine! Anyway, the clean/oil/adjust was $45, so I'm $194.50 into restoration. The case on this Imperial Tank is 37.5mm long lug to lug, by 25mm wide, not including the crown. There is no mistaking that this was a man's watch, at least by standards of the day. 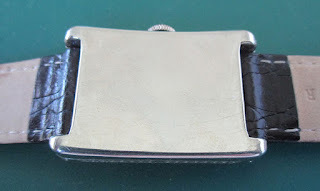 It is solid 14kt white gold. It is the Tank Model #17, as was recorded in the Gruen "Guild" master catalog of 1929. 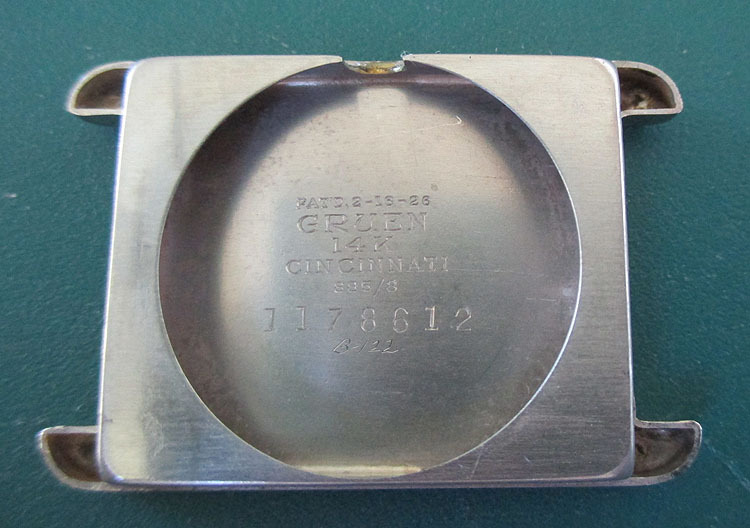 It is the same as the Model 16 in green solid 14kt gold. It has a very pleasing decorative engraving on the top and sides of the case. The case is in excellent condition with no personalized engraving. The pierced lug holes are nice and round, not all stretched out from excessive wear. Dial and hands, as mentioned, are refinished. Very nicely done, including the SWITZERLAND signature on the bottom. 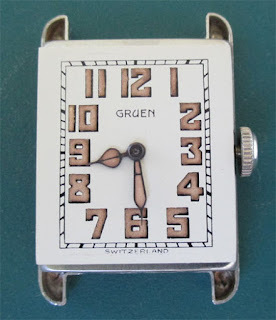 All Gruen wristwatches, at least those produced under Fred Gruen's aegis, are signed SWITZERLAND at the bottom, not SWISS. The story goes that Fred insisted that Gruen dials bear the name of the actual country of origin, rather than SWISS which is merely an adjective. The crown is most likely a replacement, but it is a correct crown for the age. Acrylic crystal is also a replacement. The Caliber 885 is a basic FHF (Fontainemelon) 10.5 ligne Grade 1186, finished in house at one of Gruen's facilities in Switzerland. With 15 jewels, it has hour and minutes only; no seconds. 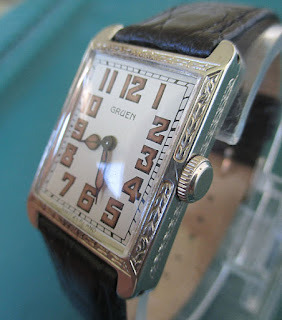 The history of the Gruen Tank is interesting in several respects. They were only made for seven years, from 1923 to about 1930. If scarcity is any indication, the models did not sell all that well. The case design is quite interesting in that the back covers the complete watch, even the lugs. Also, there is an extra collar between the stem and crown designed to keep out dust and moisture. I believe it is these two features that gave Gruen the idea for the name ... i.e, "built like a tank." 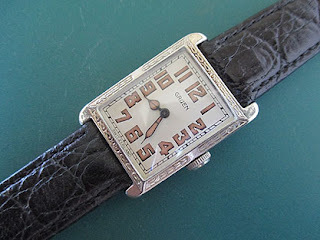 The fact that the watch bears a striking resemblance to the Cartier Tank was, I believe, merely a coincidence. Some believe it was Cartier that forced Gruen to quit making the Tank models because of a trademark infringement. But that is not the case. As best I can tell, Cartier did not legally register the trademark "Tank" as it applies to watches until the 1970s, and didn't begin enforcing it until the 1990s. 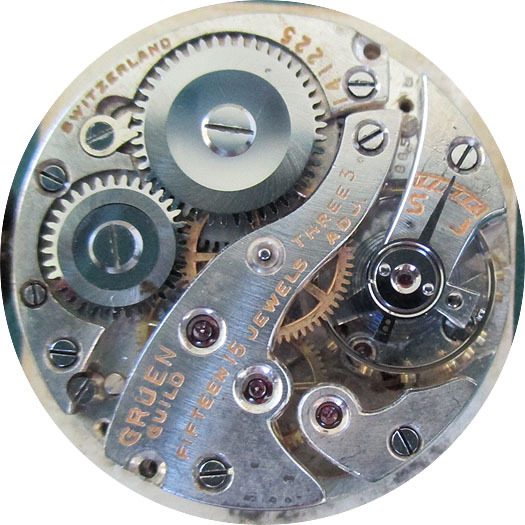 It was in fact Bulova that sought to end the model's manufacture because the company claimed it had already patented the stamping process for making the "cover-all" back. Bulova ultimately prevailed in the lawsuit ("Kay Jewelry Co. vs. Gruen National Watch Case Co.") and as far as I am aware Gruen did not produce the watch after that. Whether sales of the Tank models would have continued into the 1930s is questionable anyway, since consumer tastes were running more toward the streamlined look versus "blocky" designs like the Tank. In all, just 28 distinct Tank models were created that I am aware of. Fourteen of those were of the "Imperial" size, and of those just eight models were cased in solid gold. Which makes this "Tank" a rare find in my book. This one is going in my personal collection ... at least for now!